If you’re anything like me, you spend a lot of time in your kitchen (whether you like it or not). Personally, I don’t like to cook, but I do love my family, so I choose to feed them. 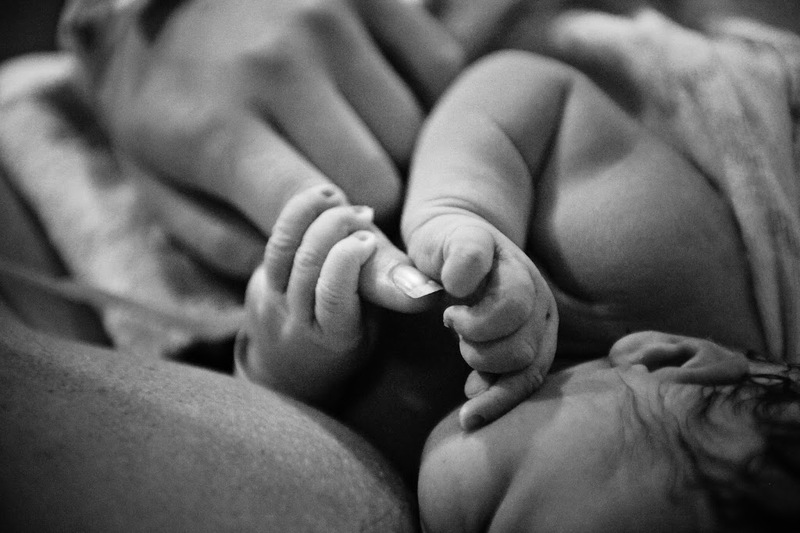 (I’m a stellar mother). Anyway, between making meals for my family, or cleaning up after making those meals, my kitchen is a central hub of activity in my household. Since I’m required to spend a lot of time either cooking or cleaning, there are two things I really value in my kitchen: beauty and function. Sometimes, those two qualities don’t go hand in hand; organization strategies may work well, but aren’t always that pretty. 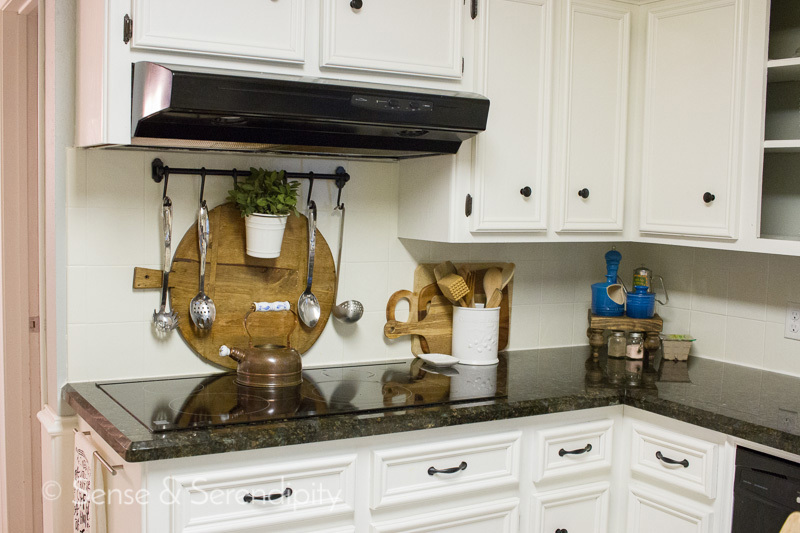 Fortunately, creating a lovely, organized and functional kitchen can be done, and I want to show you some of the most beautiful ways I have found to do it. 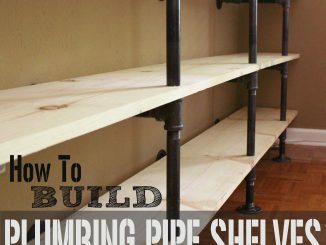 Create a Functional Vignette. 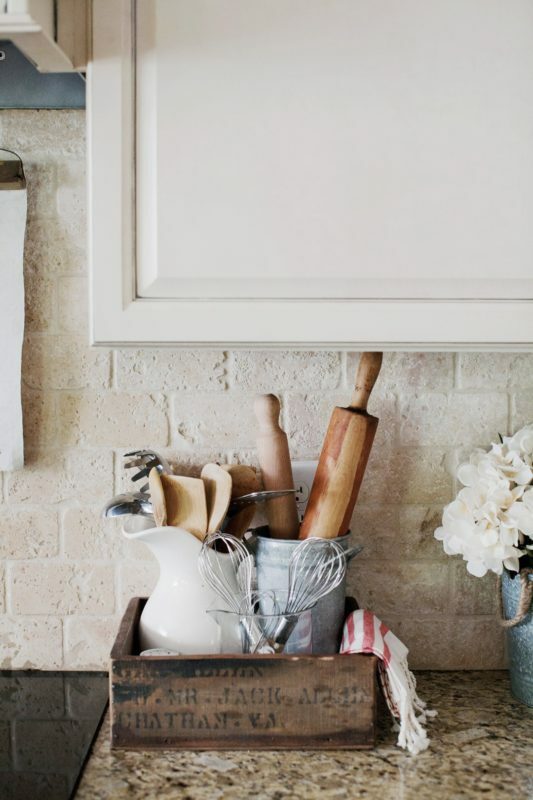 I just adore this little set-up of every day utensils in vintage containers. We all know that I’m a sucker for vintage stuff, and that ironstone pitcher has me drooling. I love the pretty display of all the useful spoons, spatulas, whisks and rollers. Everything is within reach and neatly organized while at the same time serving as a beautiful vignette (groupings of three are always pleasing to the eye). Ditch the Boxes. Holy cow, this pantry! I organize my pantry at least once every six months because it always ends up turning into a hot mess. 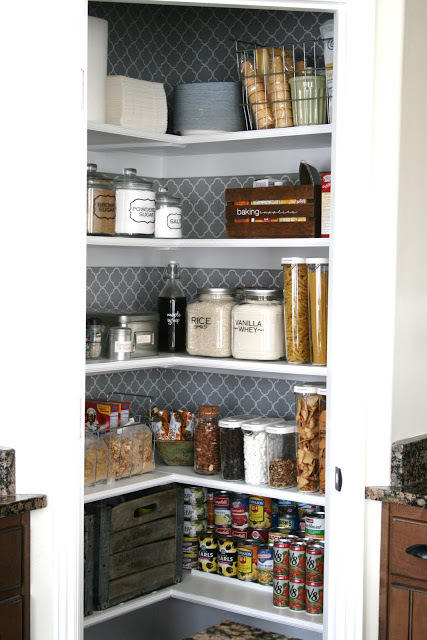 This pantry gives me all sorts of inspiration! I love how she has put all the dry goods in their own glass or plastic containers. The boxes and bags that most pantry staples come in are such a huge waste of space. By putting them in more space friendly permanent containers, you can fit more in the pantry and you are able to more easily see what you may need to replace next time you’re at the store. Brilliant! Organize By Category. 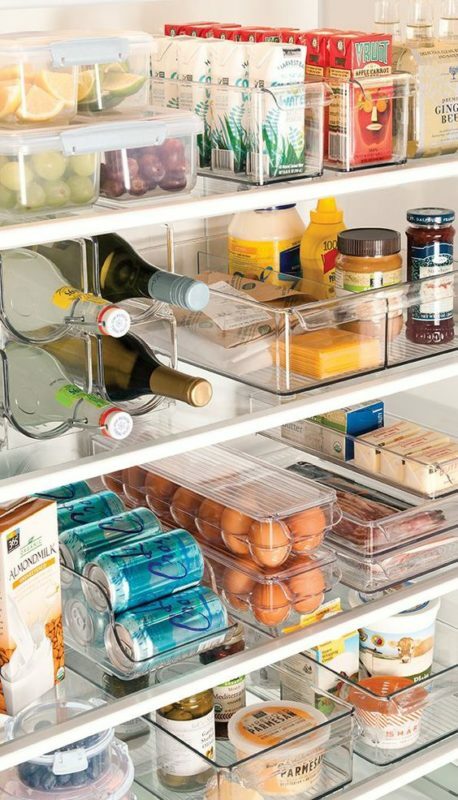 Can we all just take a moment to bask in the perfection of this organized refrigerator? Every category of food has it’s own little plastic bin, making it easier to find things and easier to keep organized. Has your fridge ever been that neat? I can assure you, mine has not. If I could get my fridge to look this organized and appealing, I would ban all inhabitants of my household from removing anything from it. No, children, you may not eat the food because it is just too pretty. Go find something in the hot mess of our pantry. Look Up. I do love a pot rack. I think it’s a genius use of space. I especially love a pot rack with gleaming copper pots, but this one is just as pretty. I love how the pot rack gets the most cumbersome objects in your kitchen out of the cabinets, leaving you with more room for other things. 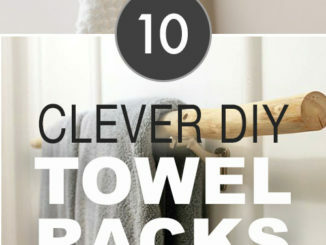 I also love how the pots are easy to reach and put away, unlike shoving them into the depths of an overstuffed cabinet. Simplify. 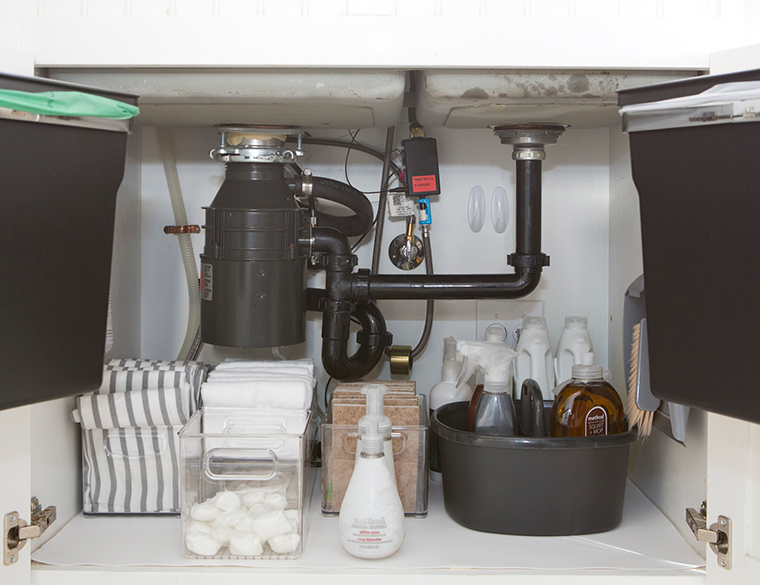 I know the underbelly of a sink is not very glamorous, but this one is organized so perfectly that I think it deserves to be recognized. I love how this space neatly houses everything you need, but nothing more. It’s simple, it’s clean and it’s perfect. Display Your Food. 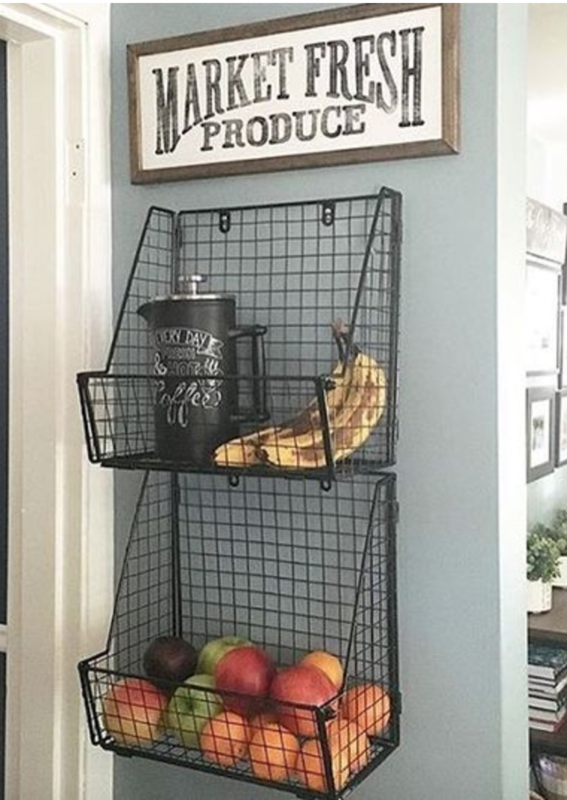 I really love this clever produce storage idea. Did you know many fruits and vegetables shouldn’t be stored in the refrigerator? Keeping them out on the counter, or in this case, in a storage bin, keeps your produce fresh and retains the integrity of the flavor. I also love that all your beautiful produce is within eyesight so it reminds you to grab the delicious looking apple instead of a handful of M&M’s for a snack. Create a Dedicated Space. There are not enough heart eyes emojis to express my love for this space. It’s clean, it’s simple, it’s beautiful, and it’s a space dedicated to coffee. What more could a girl want in her kitchen? Curate Your Collection. 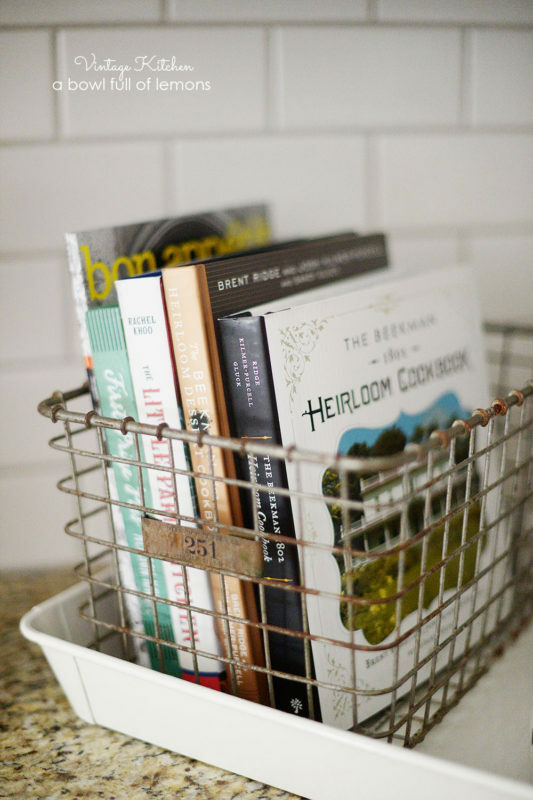 I just love this use of an old wire locker basket to corral your favorite cookbooks. My husband has at least 45,000 cookbooks. It’s a problem. I love the idea of taking a few of his favorites and making a statement with them (and hiding the rest in a bookcase because OMG WHO NEEDS THAT MANY COOKBOOKS?). Add Some Space. 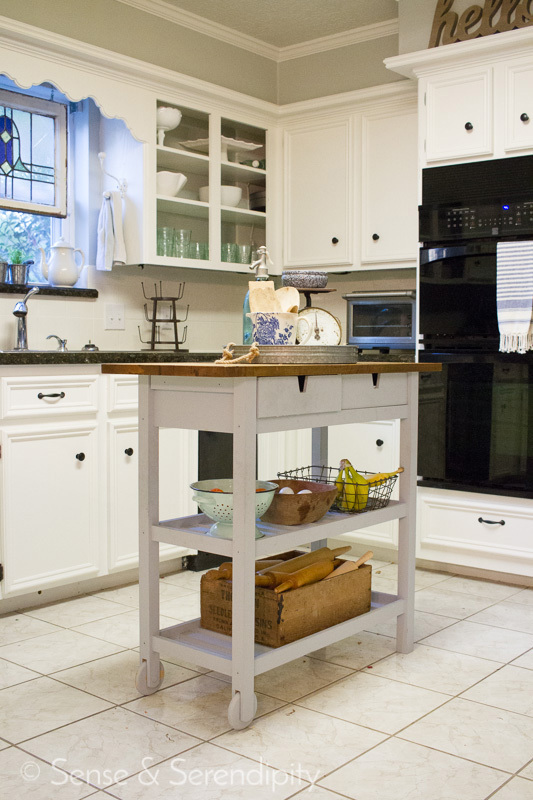 In my kitchen, we added a bit of prep space and storage by adding a small kitchen island. We got this from IKEA and I painted the bottom with chalk paint and stained the top with an all-natural tea stain so that it would be food safe. I love the extra storage it gives me and it makes chopping fruits and veggies a breeze because I have a giant cutting board always at the ready. Hang It Up. Another IKEA hack that I just love in my kitchen is this hanging utensil rack. These large spoons are used on a regular basis in our kitchen and I love to have them right at my fingertips. Not to mention that they were so large they wouldn’t fit in any of our drawers! I also think it makes a pretty little display behind our range. Function and beauty! 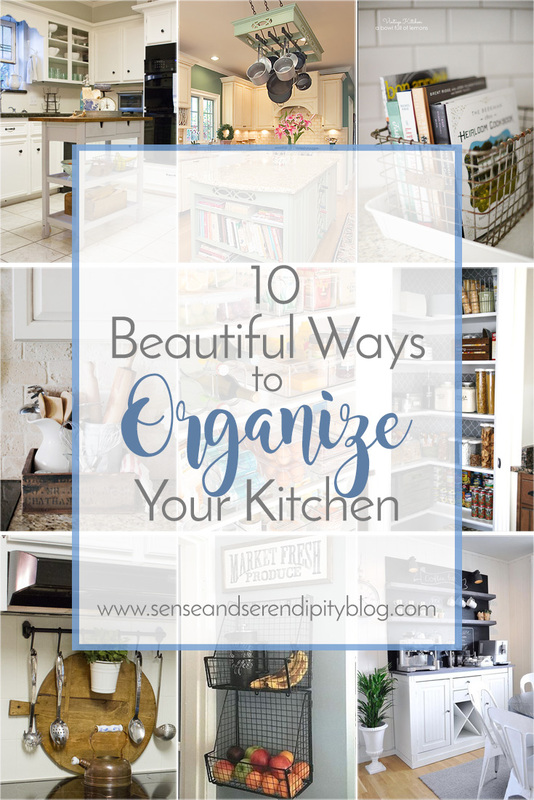 As you can see, there are so many clever ways you can create an organized, functional kitchen that is also beautiful and a pleasure to work in. 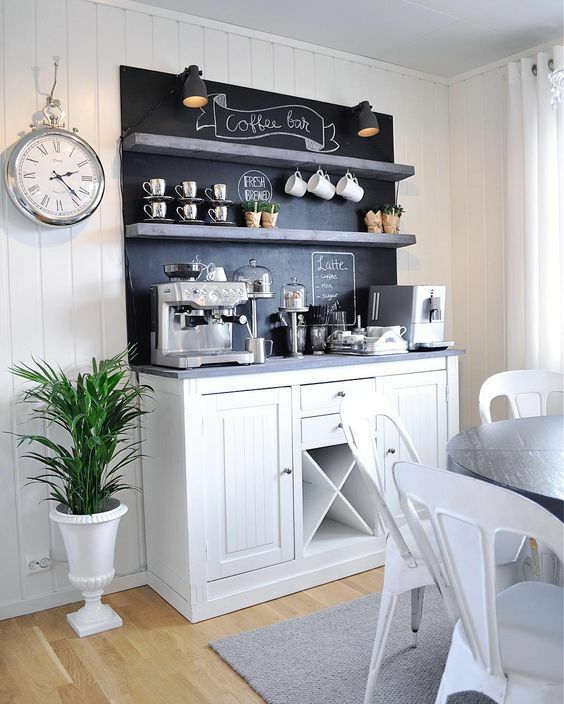 Even if you love to be in the kitchen (God bless you), you have to admit that when your space is well organized and lovely, it just makes being there that much more enjoyable! 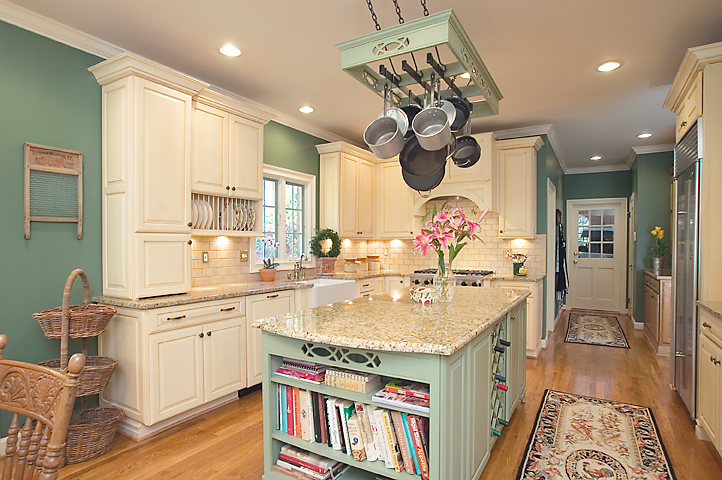 What are some of your favorite ways to merge function and beauty in your kitchen?